These are challenges that you, as a community-based financial institution, can help these businesses address. And the reality is this; servicing the financial needs of these under-funded** businesses can be a significant revenue stream for your institution in the coming years. As these small companies mature - currently only 39% reported they have sufficient financing and 41% rely on their owner’s personal finances to fund operations** - many will seek financing. They will likely start with business credit cards and graduate to a revolving line of credit. Some will apply for SBA financing through your institution. Others may want to finance an equipment purchase or buy the facility they are currently leasing. Given that the first request for financing is often a line of credit, your institution should have a clear strategy for how you would structure such services. Lines take many forms, and technology has significantly impacted this area of finance during the last ten years. As with most relationships, it all comes down to business needs. 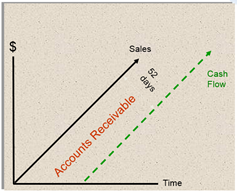 There are three primary metrics that drive businesses to seek accounts receivable (AR) financing. How much AR do they carry, as a percentage of total assets? How fast are they growing? How quickly and consistently do their customers pay them? Across all US industries, the average turn rate for AR is about 52 days. As a business owner, if I knew that every account would pay in exactly 52 days, I could fill that gap with permanent working capital cushion and be just fine moving forward (reference Exhibit 1a below). But the fluid nature of accounts does not allow for that level of predictability, driving businesses to seek AR financing, filling gaps and helping fund growth spikes (reference Exhibit 1b below). There is also a big difference in how cash flow pressure “feels” depending on which desk you occupy. To the average young commercial lender who has never run a small business, it looks something like Exhibit 1a. To the small business owner living the daily realities of cash flow, it feels more like Exhibit 1b. 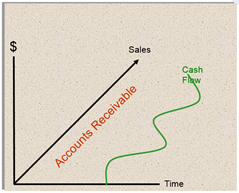 It is important to remember the benefits available to a business that has successfully financed its accounts receivable. Having cash on hand can translate to an overall reduction in cost of goods sold via vendor discounts. It can also be the difference between success and failure. Every lender should be trained, therefore, to ask some key questions when talking to business owners about their AR financing needs. Have you missed recent growth opportunities due to cash flow constraints? Are you able to take all prompt pay and/or volume discounts offered by your suppliers? If you could consistently pay cash within five days of invoice, would you be able to negotiate better prices or discounts with your suppliers? If all your accounts paid within terms, how would it impact your ability to make key business decisions and manage your operations day-to-day? Failure to answer “yes” to questions one and two above could indicate the business is dealing with a cash flow timing issue. Of course, it could also indicate a profitability issue, which should be addressed during the underwriting process. When deciding which credit structure is the most appropriate, financial institutions must weigh the benefits to the potential borrower against the credit controls that should be in place to manage risk. This is often driven by the size of the proposed facility, the availability of data regarding each account being financed and of course the overall strength of the business and its owners. Most institutions will find that they need to offer varying degrees of control to accommodate as many business scenarios as possible. Exhibit 2 covers the most popular forms of financing in the market today. Which financing method is best for the business? Every credit structure listed above has seen significant enhancements in technology in recent years, as it relates to an institution’s ability to track collateral values, covenants and exceptions relating to loan agreements. As you develop your strategy, it makes sense to see what options are available to your institution. The final decision regarding the method of financing used should be made after joint consultations between the lender, the business owners and key members of the business’ advisory team, including the CPA. All the factors mentioned below should be considered. There is significant opportunity for businesses and financial institutions to work together in this area of finance. You will also find that handling the working capital component of your clients financing needs opens the door to the rest of the relationship. 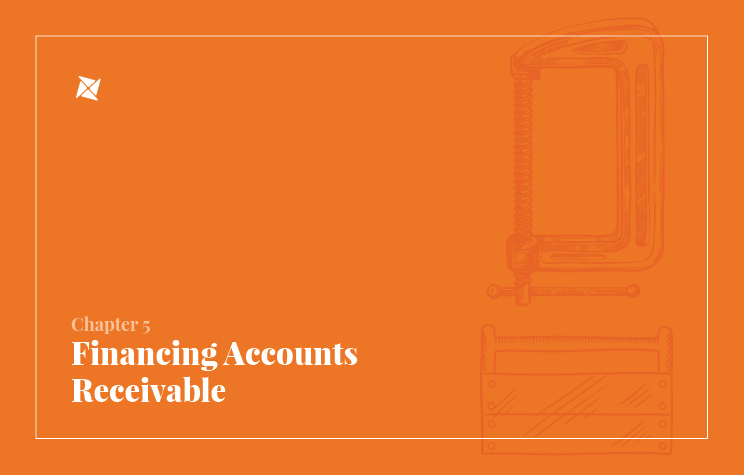 When you have a line of credit in place, you should also have the operating accounts. This places you as the number one contender to provide any other form of financing needed as the business expands. So, ask yourself, how will your financial institution engage this market in 2019? In the meantime, please also consider downloading our 2018 Guide to Working Capital Finance for more detail on this subject.